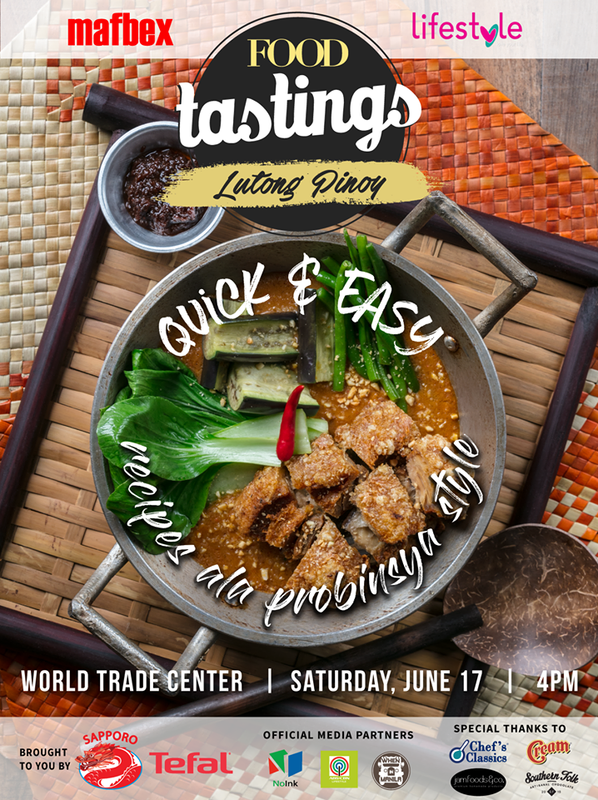 Discover quick and easy Filipino dishes from actress and now cookbook writer Pokwang, and from Chef Sharwin Tee, Chef Deejay Santos, and Chef Michelle Adrillana at “Food Tastings: Lutong Pinoy” happening at the World Trade Center on Saturday (June 17). Every quarter, Food Magazine hosts a live cookfest via “Food Tastings” led by various renowned chefs. This year’s second leg is in partnership with Manila and Food Beverage Expo (MAFBEX), the biggest gathering of food enthusiasts and professionals from all over the country. With the theme “Lutong Pinoy,” the upcoming fair will bring local recipes a la probinsya style, or Filipino concoctions that are popular in various provinces. Enjoy Pokwang’s funny anecdotes while she demonstrates some of her favorite dishes at the grand cooking event. The comedienne is currently promoting her book collection of own recipes, “Patikim, Pokie” from ABS-CBN Publishing. Chef Sharwin Tee, host of Lifestyle TV’s “Curiosity Got the Chef,” will be showcasing his own version of munggo guisado, a favorite vegetable staple in many Filipino households. Chef Deejay Santos, in partnership with Tefal, will be teaching a simple creamy tapa pasta recipe as well as sharing tips on how to prepare a BBQ sisig quesadilla. Another guest kitchen master, Chef Michelle Adrillana, will be presenting Filipino noodle recipes that are easy to prepare courtesy of Sapporo. Aside from learning new recipes and cooking tips, the food fest participants will get to try the best-tasting fares freshly prepared by the guest cooks. 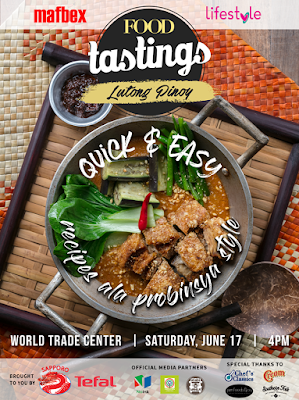 Join “Food Tastings” at the World Trade Center on Saturday, 3PM. Interested parties may pre-register online via foodmagazine.abs-cbn.com. For updates, follow Food Magazine on Facebook (facebook.com/foodmag) and Instagram (@foodmagazine).